Okay, so you’ve been taken through the journey and sheer luxury of The Blue Train – now it’s time for the best bit (in my opinion)…the food. From the minute you step into the Dining Car with its crystal glassware, crisp white linen and welcoming waiters, you know you’re in for a real treat. There’s a strong emphasis on local ingredients with some really clever combinations and a comprehensive wine list of top South African wines. You can choose from two dinner sittings (6.30 or 8.30) or eat in your suite. First meal – lunch/brunch. 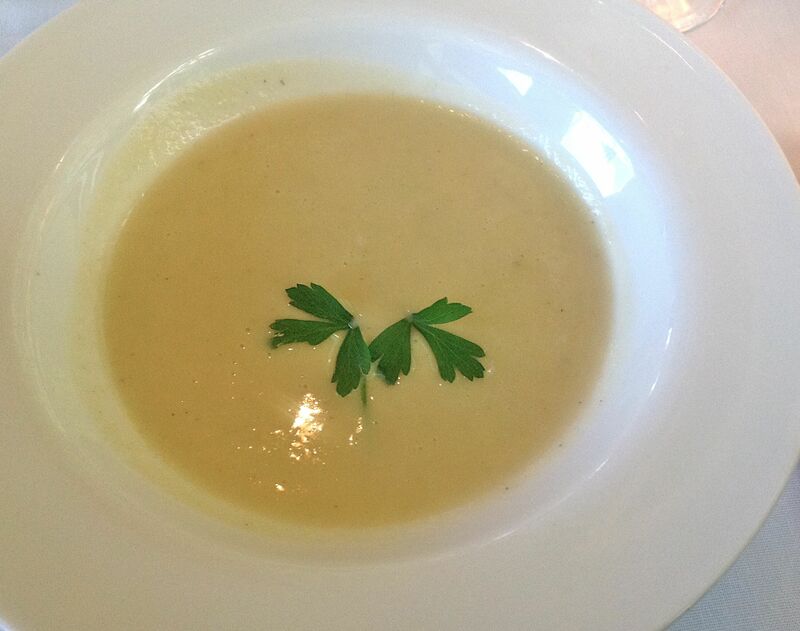 There’s a choice of two starters, a soup affair and three mains as well as dessert and cheese. 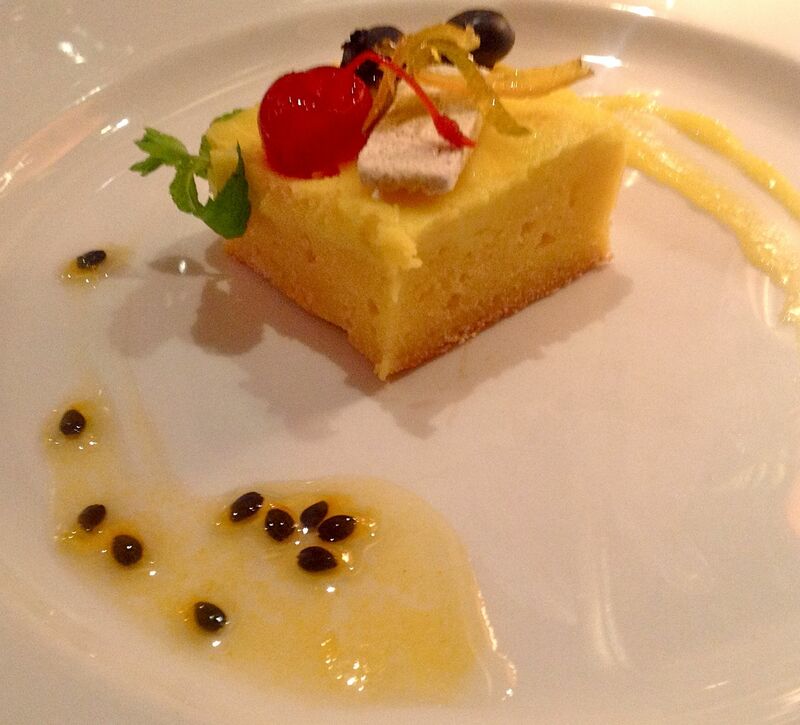 Service is wonderfully relaxed and friendly, yet efficient and well paced between courses. And the food is certainly something to write home about. 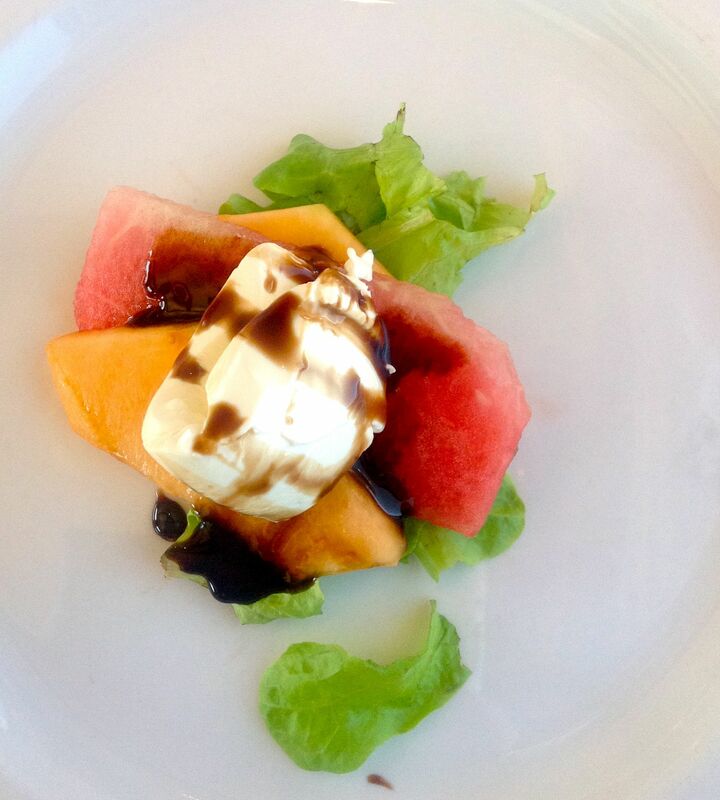 This perfectly pretty starter of goat’s cheese mousse came with grain mustard, compressed melon and micro greens and an aged balsamic glaze. Light and refreshing. In in-between bowl of cauliflower and truffle soup was beautifully earthy and rich. When I look back on my menu choices, I seem to have eaten a lot of red meat on this trip. A great choice as it happens as everything was totally delicious. This charmingly named lattice beef loin was amazingly tender, packed with flavour and served on a sweet potato puree with rosemary and mint jus. The perfectly prepared and cooked julienne vegetables were a sight to behold on their own – amazing attention to detail and flavours on this plate. I savoured every mouthful. Between lunch/brunch and dinner there’s High Tea in the Lounge Car. A fine array of sandwiches, cakes and an amazing cheeseboard tempt you. Aware that dinner wasn’t too far away (I was allocated the early sitting), I held back but couldn’t resist one perfectly soft and crunchy, crustless cucumber sandwich. And a glass of bubbles, of course. 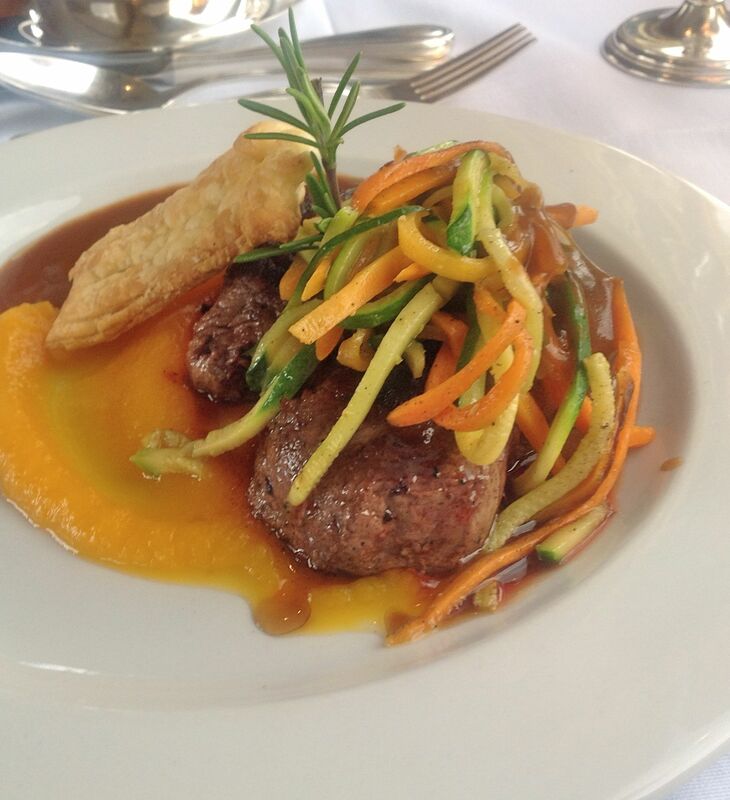 Time to get back to the charm of the Dining Car and some amazing dinner choices. First off a really novel foie gras dish – caramelised foie gras served with amadumbe ( a tubular root vegetable much like a yam) oat granola and lemon powder. 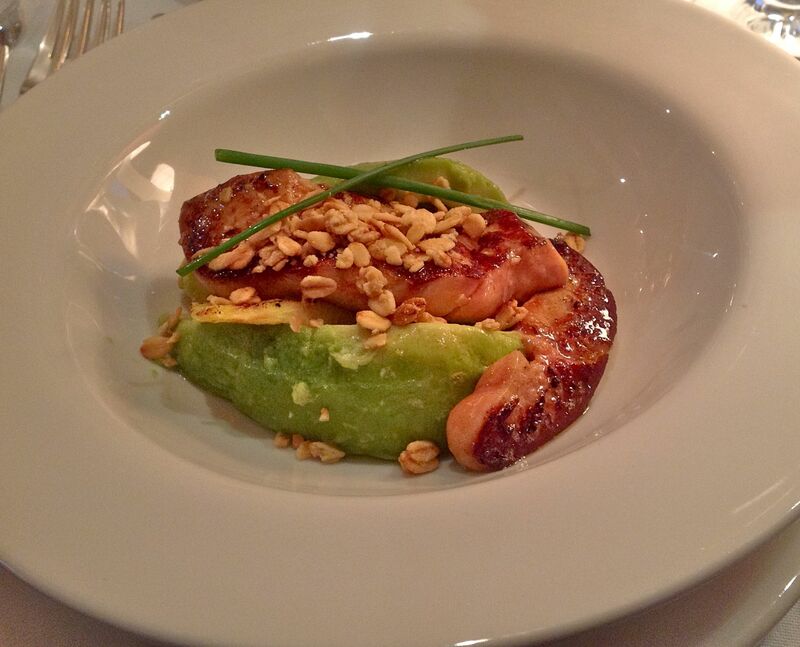 It was served with beautifully creamy avocado (which also added a lovely green vibrancy) – what an amazing combination of richness, sweetness and tenderness that produced. A dish to dream of. I was still basking in the pleasure of these taste sensations when my main course arrived. 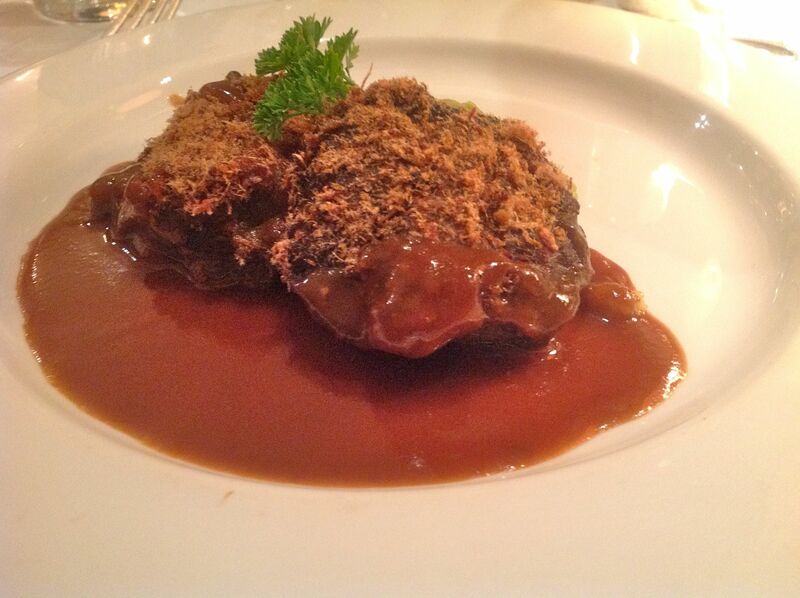 Ox cheek covered in biltong powder, served with a potato waffle, pea puree and marrow sauce. So many local ingredients in a cleverly conceived of dish. Love it! With such exceptional food being delivered to my table I simply had to try out the dessert – in the name of research of course. And because lemon desserts are my one true dessert love. The lemon tartlet was served with a citrus curd and passion fruit jam, topped with a lemon foam and finished off with a lemon macaroon. Beautifully light and zesty, the perfect conclusion to my lovely dinner. I’ve mentioned that the wine list is fantastic…and even better you can order all the wines by the glass. Basically everything is available which makes for the most fabulous tasting opportunity. Happy and replete I retired to the luxury of my suite for an early night and an early awakening so I could watch more of the South African world go by when it got light. And then to breakfast. Well, can breakfast be your favourite part of a trip? It’s just that I don’t ever remember being presented with such an amazing breakfast menu, which is why I simply had to include it in all its glory! 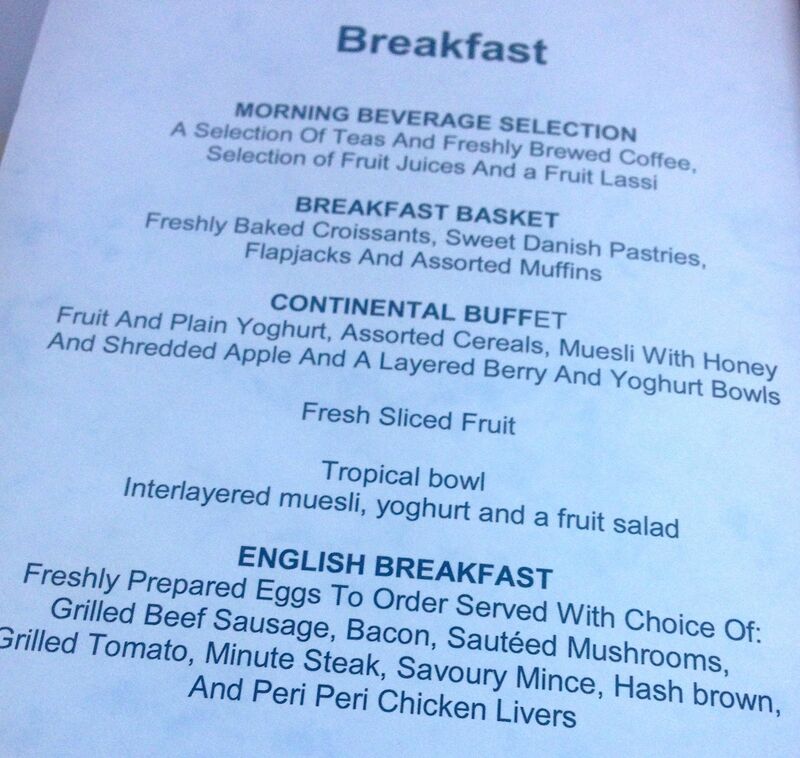 Love the selections under the English Breakfast heading – can you imagine what a plate full of all that would look like? There’s two pages of choices…what a way to start the day. 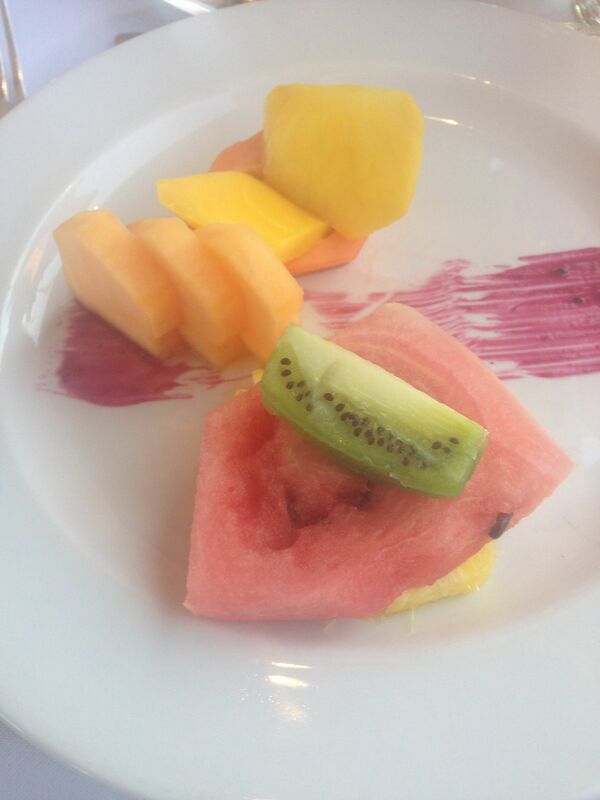 From page 1 I enjoyed tea, fruit juice (and they had my favourite, guava) and a lovely plate of fruit, which again included all my favourites: mango, pineapple, papaya, watermelon, melon…fresh and juicy. And then it was on to page 2: Speciality Breakfast. How to choose, how to choose! 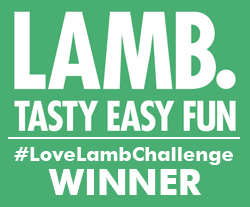 Well, I adore Eggs Benedict, so that made it all that little bit easier. But then my lovely waiter asked me if I’d like any extras on the side…and I had to add some peri peri chicken livers! 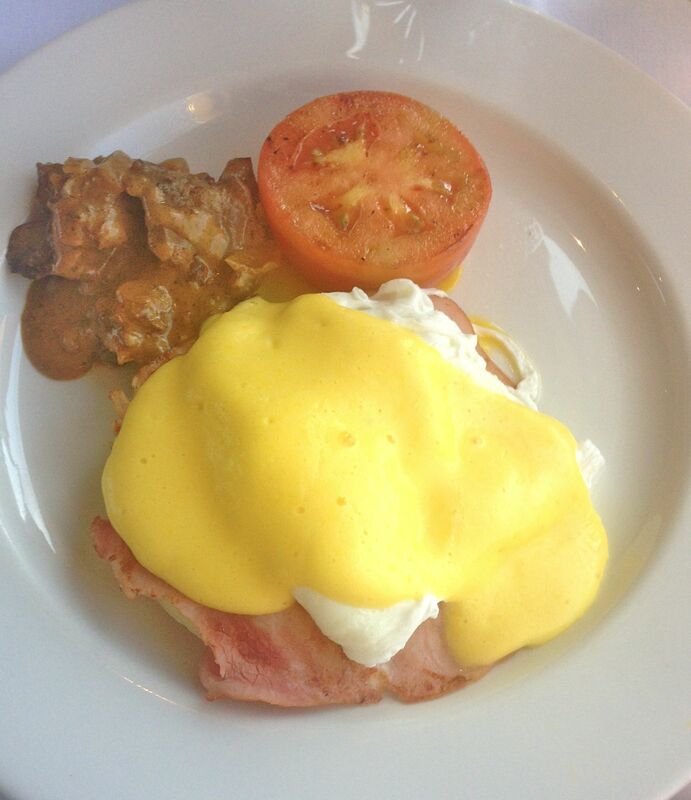 I’d say this could be the best Eggs Benedict I’ve ever had (and I’ve tasted my share of this classic dish). Breakfast doesn’t get better than this. I had to drag myself out of that Dining Car, and it wasn’t easy. With my love of train travel, the Blue Train’s luxury and incomparable service, the fabulously unfolding South African countryside outside the window and then the truly amazing, creative food with a real local flavour I knew I’d been cocooned in my own special paradise. I still miss it! 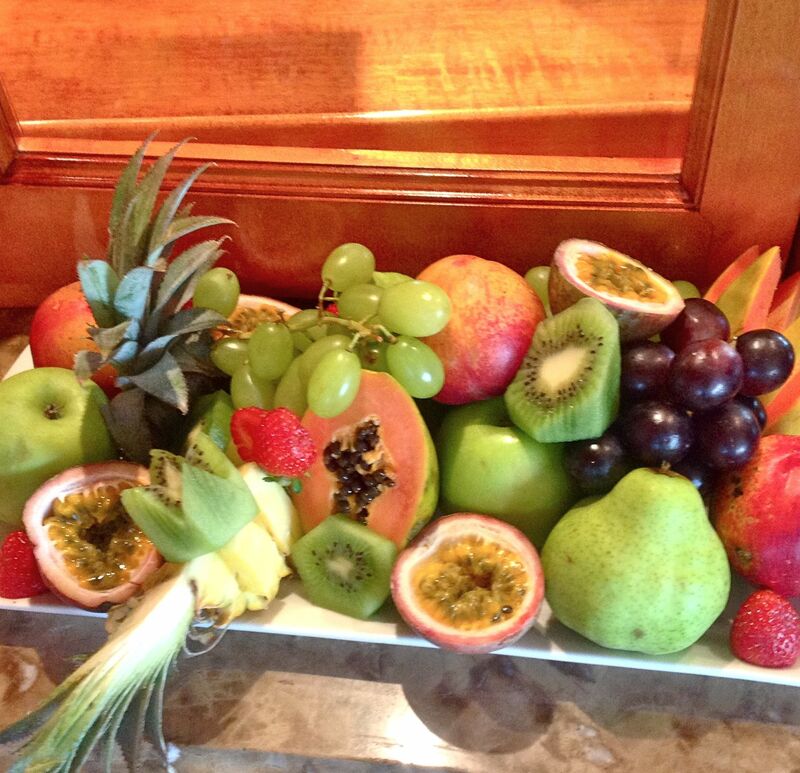 And here’s a beautiful fruit display to enjoy – all the food is a word of art to enjoy on The Blue Train. 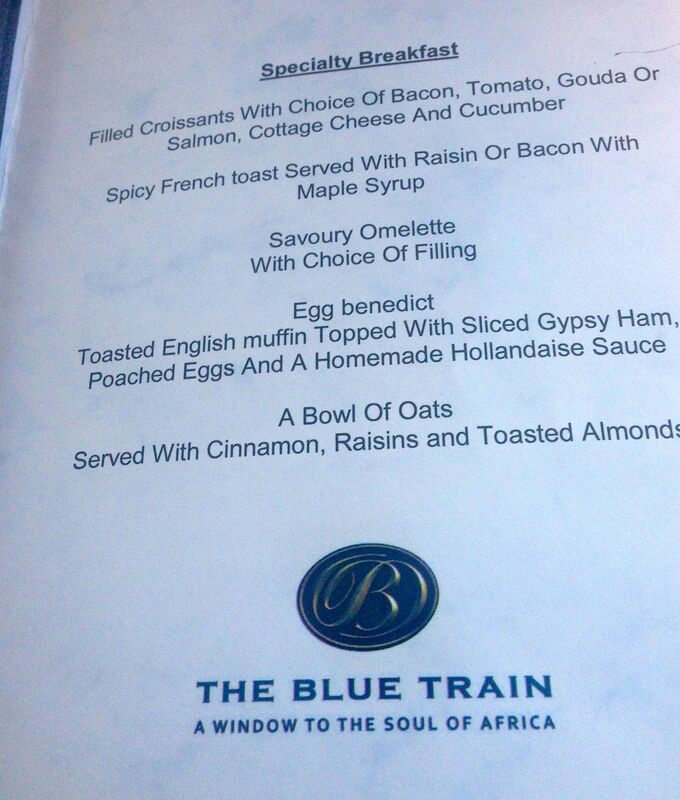 Find out more about The Blue Train by clicking here.